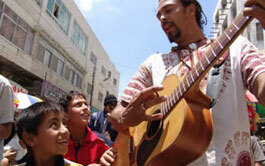 One-off screening of a documentary shot in the Middle East by Michael Franti. Spearhead frontman Michael Franti says he knew nothing about making a documentary when he and his friends took video cameras to the Middle East in 2004. "With my infinite stubbornness, I just thought I could whirl my way through it," says Franti, who also packed a guitar so that he could take his music into the war zones. "I found out very quickly that it's really difficult, so what I did was just surround myself with a lot of great people who knew a lot more about it than I did." Franti's directorial debut, the 93-minute film I Know I Am Not Alone, explores complex territory: how everyday citizens cope with both the US invasion of Iraq and the ongoing conflict between Israelis and Palestinians. "I wanted to go to Iraq and hear what people were going through as I wasn't seeing any of it in the news," Franti says. Franti and his cohorts, who included an Australian teacher and hairdresser, had some hairy moments wandering around Iraq and Israel. At one point, Franti found himself smack-bang in the middle of gunfire as he walked the streets of Hebron strumming his guitar. "I was scared every second of this entire trip," he says. "The only time I wasn't scared was when I was playing guitar, so I just tried to play my guitar all the time. When I played guitar and sang, everybody's attitude would change. Ninety-five per cent of the time it was a good change, and sometimes it was like, 'Shut the f--k up!' But most of the time people were just so ready for song." Franti was also "more than a bit" nervous about performing his anti-war song Bomb the World - with the lyric "You can bomb the world to pieces, but you can't bomb it into peace" - to a group of American soldiers in Baghdad. "I thought I was going to get my guitar slammed into the floor or something or get hit in the back of a head with a rifle, but what happened is, I went around to each person in the room, and all of them told me that, more than anything else, they just wanted to go home." the Manning Bar at 9.15pm.